Though it is often said that money isn’t everything in life and your life should certainly not revolve around an inanimate object like money, yet this having been said it is important to realize that we are living in an age of extreme expenditure where nothing comes cheap. So, keeping this in mind, it is of paramount importance that you learn to both spend and save your money very wisely so that you live comfortably now and save enough for your future. 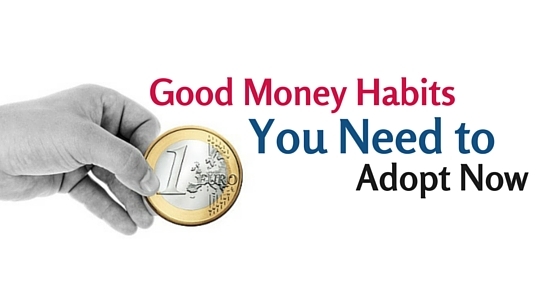 To help you here is a list of good money habits which you need to adopt now. Right at the onset it is of paramount importance that in order to develop good money habits, you have to live within your means and know exactly how much money you are permitted to spend in a month. There are many people across the globe that really live life to the fullest at the start of the month without even caring and then as the end of the month draws near they are absolutely high and dry. So ensure that you are not one such person and you should try and inculcate good money habits in your children as well so that from a young age they learn to live within their means. Living life on your own terms and not having a care in the world is a good thing indeed, yet at the same time it certainly does not imply that you neglect you responsibilities and just spend your money at will. In the event of trying to impress others and create a good impression in their mind you should never spend money which you cannot afford to be spending in the first place. You should remember that something as petty as well as paltry as money should never come in the middle of a friendship, yet that does not mean that you keep spending the money and they never come forward to do so. Investing your money in the correct way is something that is very important indeed. If you do not save money how will you survive after your retirement? This is an age where no one has excess money so you cannot possibly imagine that you will live off your children. In the event of things not working out as planned will end you up on the streets. So no matter what, you should always aim to be self sufficient and the only way to do so is saving up wisely. So as per your own wishes you can invest your money in a fixed deposit in the bank or in a savings account. There are many people who accept each day in life as a new adventure with new things waiting to be explored. So if you are one such person, you too might consider investing your money in the stock market, when you do so you should always be prepared for the worst to happen. There are so many people across the globe that have lost everything they have by investing all the money they have in shares as well as stocks. So it is always advisable to invest only after doing your homework, but also don’t pin all your hopes in one place alone as this could be disastrous. Each one of us has a particular list of things which we need to spend on each month, so inculcating a great money habit in yourself helps in making a budget for each month and try your very best to stick to this budget. Naturally things might be a little here and there but as long as you are being able to make two ends meet and having a little surplus for your savings you need not worry at all. When you make a budget ensure that you are not underestimating your expenditure in any way at all, otherwise this entire exercise will not only be pointless but also a waste of time. It is needless to say that the only thing constant in life is change and not one of us can ever know when a single moment in time can change our lives forever. So we should always be prepared for whatever hurdle life may throw our way. Something as grave as an illness or even an accident might strike at any given point in time and it is of paramount importance that we are always prepared, so for this very reason you should ensure that all your family members have medical insurance because paying the bills yourself will burn a hole in your pocket. In the event of trying to impress friends as well as neighbors, there are many people who actually go as far as to take a car as well as house loans which they cannot afford to take. It is always better to save up and finally buy the car or house on your own steam, rather than having the burden of a loan on your head. In addition to having to pay the huge amount of money, interest rates are also very high in themselves. So ensure that you do not take any decision unwittingly and actually weigh and measure everything which you do carefully so that you do not land yourself in any trouble. One of the good money habits you can inculcate is actually saving your money and living frugally. The little sacrifices which you make now will help you immensely in the time to come. Living life in this way might not come easy at first, but over time you will realize how necessary it is. However this having been said, it does not mean that you become overly thrifty and stop spending money at all, it just means that you know where to draw the line and think twice before spending your money in such a way that could land you in financial trouble. Do not spend money on things which you do not need. At some point in time or the other we have all been guilty of purchasing things which we thought we will make use of but have actually never done so, all such mistakes are acceptable in your youth, but as you grow up and mature you should ensure that you value money. In this day and age money is most certainly a valuable resource which does not come easy at all, so you must try your level best to use it wisely and not waste it at all. As mentioned above, in addition to buying things which we do not need, all of us, at some point of time or the other have also been guilty of buying things impulsively. Unfortunately this is noticeable most often in women who get overly excited when they go shopping and convince themselves they want and need something even if they really do not. So unless you are actually sure of something and really know for a fact that it is something you will make good use of you should abstain from spending unwisely. So indulging is a good thing but too much indulgence isn’t good at all. In the event of wanting to buy something really expensive like a watch, a car or even a television you should not just walk into the shop and buy the first product which you lay your hands on, rather you should ensure that you do your research well and actually evaluate the pros and cons of buying the particular item. Just because you walk into a shop, you should not think that you have to buy something. You should remember that it is your money and as long as you are not completely convinced about the product you need not spend your money on it. In the event of not know how to invest your money or how exactly you can save money, you can always consult an expert who will give you invaluable advice on how you can save money. Consulting a skilled professional is merely a onetime expenditure, but the things which you will learn will help you through your life. In addition to consulting an expert you could also consider attending a class or even purchasing some good books online which can give you some invaluable tips to guide as well as assist you along your way. Keeping a proper tab of both your income as well as your expenditure could really help you know exactly where you stand. There is no point in spending too little of your money when you can afford to live a little more lavishly and at the same time there is also no point in spending money which you cannot afford to be spending. So as mentioned above it is important to make a budget, yet at the end of the month it is equally important to make a note of all the miscellaneous expenditure which you had, that might or might not have been necessary. At the end of the day all of us have some loose change which we just leave lying around our coffee tables, so rather than doing this you can keep a little piggy bank for your loose change and at the end of the year, you will be surprised to know how much it has added up to. Not using their credit card in a proper as well as responsible manner has landed a lot of people in plenty of trouble so you must ensure that you limit all your credit card purchases to only that amount which you can easily pay off at the end of the month. A great habit which you should try and develop is stocking up on clothes as well as groceries at that time of the year when there are heavy discounts as well as sales going on in the market or mall. Also you will be surprised to know how much money you can save by buying in bulk. Last but certainly not the least is that you will never be able to develop any good money habits if you are constantly wasting money on drinking and clubbing. In addition to this, one of the worst things which you can do is waste your money gambling and placing bets. So these are some of the money habits which you need to adopt now so as to ensure that in time to come you do not find it tough to survive because in the future the expenditure is only going to increase. If you are someone who is in the habit of spending then right at the onset you might find it extremely tough to develop these good money habits and live within your means, but in time to come you will realize that you need to pull up your socks so that you as well as your family do not have to beg, borrow, steal or even be at the mercy of others.